After months of prep my 4 tiny PPs finally arrived!! They’re currently in a 25 gallon tank, though I’m looking to upgrade soon. I am however having issues with maintaining a high humidity? It was at 85% last night but just now, when I put the crabs in, it had gone down to 60. I heard that over-spraying can cause flooding, is there any way to help maintain the humidity? What type of lid do you have. If it is mesh, putting a towel over it, along with saran wrap can help with both heat and humidity particularly if the towel is damp. That is a cheap easy way to fix a mesh lid. Others use plexi-glass on their mesh lids as well. Just be careful if you have heat lamps and what not. bubbler's in your water dish. I do think some also use room humidifier's but that can also lead to flooding if not careful I do believe. I have them in a tote right now, so the lid is pretty well sealed. I will look into getting a moss pit, thank you very much! Congrats on your new little friends! I love when they are teeny-tiny, they are so cute! Please share pictures. Awww! Such cuteness! I love the teeny-tinies! Just soo adorable! 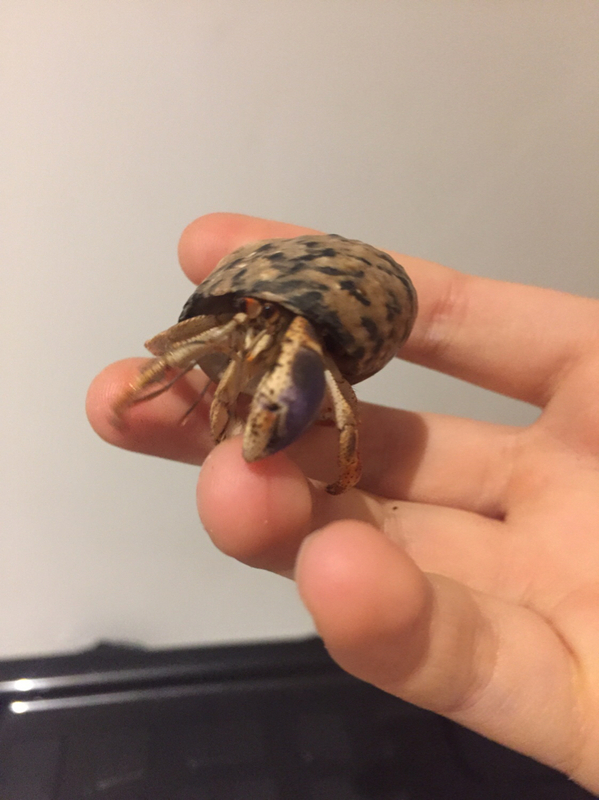 Is Walnut missing his small pincher? Or is it the picture? Not that it matters, still so precious. Just needs some extra calcium and protein. I’m pretty sure he is, yeah. Just to be safe, I added plenty of eggshell into their first meal. Now just waiting for the first molt. Once they start changing shells there's no keeping track of who's who. For a mesh lid you would want to put press n seal or plastic wrap on the mesh lid first not a towel. A towel would absorb the moisture. How much substrate do you have? The deeper the substrate is, the more it helps with humidity. Substrate should be 6 inches or 3 times the height of your largest crab (whichever is deeper). It should also be mixed with dechlorinated marine saltwater or dechlorinated freshwater to make the substrate sandcastle consistency. Walnut is so cute! It’s shell looks like it fits its personality!